Chesapeake Square Pawn offers professional written appraisals performed on your item or an item that you purchase from us. 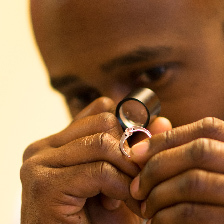 Appraisals are performed in house by Gemological Institute of America (GIA) certified gemologists. Our average turn around time is 3 business days, depending on the complexity of the item. Prices start at $50. Discounts are given for multiple items. We maintain electronic copies of all appraisals so in the event you need another copy, simply let us know. We are glad to provide you with a instant verbal appraisal of your item or an item you purchase from us at no charge. If you are leaning towards a private sale of your item, we are more than happy to evaluate it and suggest a fair asking price, at no cost. Whether for insurance, replacement, sale, donation or gift giving purposes, an appraisal is an extremely valuable tool to have for each of your fine jewelry pieces. An appraisal is a document in which a jewelry professional very specifically describes your item and establishes it’s value in the current market. It includes the type and style of the item, the overall weight, the variety and karat of metal as well as any inscriptions, the color, cut, clarity, and carat weight of any diamonds or gemstones that the piece contains, as well as any treatments those stones may have undergone, and a picture. As the market fluctuates, so does the appraised value of your item. For this reason, it is recommended to have your appraisals re-done every 2-5 years. An appraisal is not an offer to purchase your item, nor does it indicate the price that we would pay if we were to purchase it. An appraisal also does not indicate the price that the item was originally purchased for from the retailer. Even in the retail market items are hardly ever sold at appraised value, they are sold for less. Appraising jewelry is not an exact science. There will be variation in an item’s appraised value from one appraiser to another, however the values should be within a similar range. The accuracy and validity of your appraisal depends entirely on the level of expertise of the person performing it. The most well respected appraisal is one performed by an experienced, GIA certified gemologist, such as those at Chesapeake Square Pawn!